PAYS BAS – Amsterdam - Five telescopes made of bone and dating to the 18th century have been discovered in Amsterdam, with two of the scopes found in the equivalent of toilets. At the time, called the Enlightenment, the telescopes would have been considered luxury items and were likely used to gaze at objects on land or sea, rather than to look at the stars. They were created during a period when Amsterdam was a flourishing center for trade, one that attracted talented craftsmen. Ranging in length from roughly 3 to 5 inches (80 to 140 millimeters), the telescopes were made using cattle metatarsal bone. "This particular bone of cow, the metatarsal bone, is actually quite straight and round," Marloes Rijkelijkhuizen, of the Amsterdam Archaeological Centre at the University of Amsterdam, told LiveScience. "It's a nice shape to make these telescopes from, it's straight and (has a) very round narrow cavity." Each telescope would have had a pair of lenses — like the system used by Galileo — a convex objective and a concave ocular, to magnify objects. (Two of the telescopes have at least one lens intact.) The longest of the telescopes, which had both lenses intact, is made of two parts put together with a screw thread, and was equipped with a bone insertion that has a small hole and likely functioned as an aperture stop. With a magnification of about 3, the telescopes may have been used as opera glasses, held up by their wealthy owners to get a better view of the stage. Another idea is that someone going to sea, perhaps as a ship passenger, toted these with them. 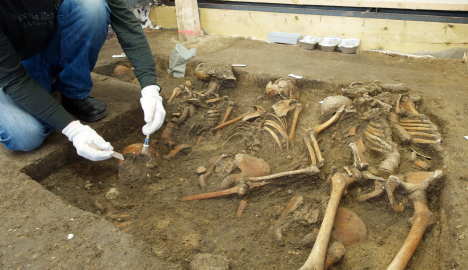 ALLEMAGNE – Lützen - Archaeologists have started unearthing human remains from a mass grave near the German town of Lützen, a find that dates back to the Thirty Years' War. "We estimate that there are at least 75 dead, who were buried very close together in several layers," archaeologist Susanne Friederich said. The Battle of Lützen, which took place in 1632, pitted Swedish soldiers against those under the command of German Roman Catholic general Albrecht von Wallenstein. It was one of the bloodiest battles of the Thirty Years' War, with an estimated 6,500 to 10,000 casualties. The Swedish King Gustavus Adolphus was also mortally wounded during the battle. The grave was discovered in the late summer of 2011. The 42-square-metre tomb is 1.1 metres deep. "With the help of anthropological methods, the victims' ages, wounds, causes of death and illnesses will be determined," Friederich added. The archaeologist said it would take six experts a year to completely unearth the tomb. She said it is thought the dead were buried without clothing, weapons or other personal effects. Using isotope analysis, the researchers hope to be able to determine the victims' geographic origins. Historical evidence indicates that Germans, Swedes, Finns and Scots fought in the Battle of Lützen. FRANCE – Montpellier - Les chantiers de fouille ont démarré sur le tracé du futur déplacement de l’A9, afin d’exhumer tout ce qui pourra l’être - céramiques, sépultures, outils... - pour éviter que le bitume ne les recouvre et ne leur serve de sarcophage. Pour le moment, aucune trouvaille n’est susceptible de bouleverser le calendrier du chantier. "De Vendargues à Saint-Geniès, nous sommes tombés sur quatre à cinq ensembles de vestiges", précise Benoît Ode, un des archéologues de la direction régionale de l’action culturelle (Drac). 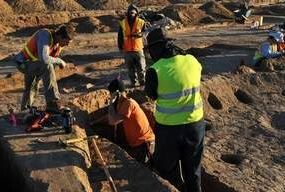 Dans le lot, figurent un site néolithique avec céramiques à Vendargues, ainsi qu’un four à chaux de l’époque romaine, très rare, à Baillargues. Un ouvrage construit près d’un aven qui n’a pas encore été fouillé. S’ajouteun ensemble médiéval, notamment des murs épais d’un mètre, construits vers l’an 1000 à Castries. Pour avancer plus vite dans leurs recherches, les archéologues ont fait appel à un drone, en fait un octocoptère (un petit engin à huit hélices, NDLR) qui a survolé la bande du tracé et fait des relevés infrarouges, dans le but de repérer par exemple la présence de sorties d’air d’éventuelles cavités ou galeries. USA – Rochester - Theoretically, Rochester could be one big archaeological dig. However, there is a particular piece of higher ground — Indian Heights Park — that continues to attract the most attention. "It's hard to figure out exactly what's up there," Constance Arzigian, an archaeologist from the Mississippi Valley Archaeology Center in La Crosse, Wis., said Sunday. "There is extensive historic use of the area, but we have no records of prehistoric use." American Indians were familiar with the site on what is now Rochester's north side. But it's unclear if they lived there, or used it primarily as a quarry, a sacred ground or a lookout post. "We want to find out what's up there," she said. "It was probably used for a lot of things." Gradually, from the time the glaciers retreated, the indigenous people of the area began to settle in larger groups and eventually began to till the soil. Later, the development of pottery caused groups to settle in one place for longer periods of time and to develop new crops and tools. "Even one pot ties you down," Arzigian said. "We see people moving less frequently, we see bigger families, and around 500 BC, the population really starts to increase." ERYTHREE – Adulis - Zazzaro, whose specialty is maritime archaeology of the Red Sea, works with Exeter University’s MARES project (Maritime Ethnography of the Arabian Gulf and the Red Sea). She has recently returned from an Italian Eritrean Joint Expedition at excavations in Adulis, an archaeological site in the Southern Red Sea region of Eritrea. She plans on presenting an illustrated description of Adulis and new information that has been discovered during her year-long stint. Adulis was one of the most important port towns for trade between the Mediterranean and the Indian Ocean beginning 2,000 years ago. During the Roman and Byzantine periods, Adulis was prominent in exporting products such as ivory, obsidian and tortoise shells while receiving imported fabrics from Egypt, glass from Judea, metals from India and wine from Italy. Excavations conducted at the beginning of the 20th century and in the 1960s revealed a deeper richness of the ancient town, uncovering monumental buildings, churches and large housing compounds. FRANCE – Cestres - Le médiéviste Patrice Beck, professeur d’histoire du Moyen Âge à l’université de Lille, a présenté les découvertes les plus récentes faites sur le site des Bordes Gaudot du bois de Cestres. La dernière campagne de fouilles a eu lieu en juillet dernier et le champ de fouilles a été, depuis, sécurisé et équipé de panneaux expliquant la vie des habitants de ces fermes importantes datant du XIV e siècle, dont les fouilles d’archéologie préventive, menées à Cestres sous la direction de Patrick Chopelain, de l’Institut national de recherches archéologiques préventives (Inrap), ont permis de découvrir une riche maison de négoce de la laine, vraisemblablement en liaison avec les éleveurs de moutons des Bordes Gaudot. Les chercheurs, après découverte aux alentours de vestiges datant de l’an mil, vont, dans les années à venir, poursuivre les études de ce lieu. Quant à Jean-Louis Maigrot, chercheur à l’unité mixte de recherche ARTeHIS à l’Université de Bourgogne, il a précisé divers aménagements du site, au puits Gaillard notamment, ainsi que les projets de recherches. AUTRICHE – A previously unknown piece by Mozart, believed to have been written when he was as young as 10, has been uncovered in Austria. 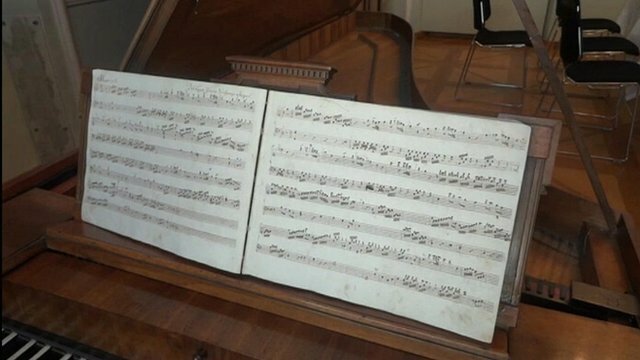 The piece, thought to have been composed in 1767 or 1768, was found in a notebook in an attic. Researchers recently determined there was strong evidence Allegro Molto is a Mozart composition. It was transcribed into a notebook bearing the name Del Signore Giovane Wolfgango Mozart. Although the music was not written in the hand of Mozart or his father Leopold, historians at Salzburg's Mozarteum foundation strongly believe it is by the burgeoning composer. Music expert Hildegard Herrmann-Schneider said only Leopold Mozart used this name when writing down his son's name. The 160-page handwritten notebook, dated 1780, also contained musical works written by Mozart's father. USA – Luke AFB - Archaeologists here recently unearthed an ancient dwelling -- just one of thousands of artifacts found here that date back as far as 3,000 B.C. "This site could be of importance to Arizona and the Phoenix valley," said John Hall, the senior project director with Statistical Research, which is doing the excavation. "We had some of the artifacts dated and this site is almost 1,000 years older than any other site in the Phoenix valley." Since October 2010, the excavation team has found thousands of artifacts around the area to help them get an idea of how the people here lived. "We believe the people to be nomadic," Hall said. "We found storage holes filled with stone tools and other things. The stone used clearly comes from a river, very different from the stone around Luke." One of the things about the site archeologists found interesting was that it dated to the poorly understood Middle and Late Archaic periods of the Phoenix Basin and south-central Arizona between 3,000 and 1,000 B.C. Archeologists have long studied the Hohokam of the Phoenix valley -- one of three major prehistoric archaeological traditions of the American Southwest -- including they way they lived, the farming they did and the plants they grew. The Hohokam occupied the valley and much of southern Arizona from 1 to 1450 A.D. The Hohokam grew corn, beans, squash and agave. They also built hundreds of miles of canals throughout the valley to irrigate their agricultural fields. This site has offered a new perspective into the lives of people thousands of years before that.